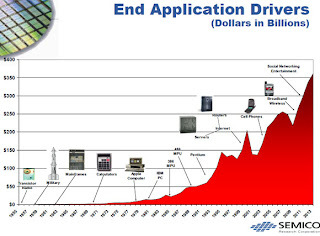 Recovery: Global chip sales have rebounded strongly since Feb 2009 to US$19.1bil in Aug 2009 after plunging in Sept 2008 from US$23bil to just US$14.2bil in Feb 2009. The sales figure managed to recover in just 6 months from mid-2003 levels to mid-2005 levels. In addition, BTB ratio, an indicator of semiconductor outlook, has also picked up from 0.47 in Jan 2009 to 1.17 in Sept 2009 in anticipation of global demand recovery. Demand will firm up in line with the recovery in major economies which are turning positive from negative territory. According to IC Insights, semiconductor industry could improve by 10.2% in 2010 and a further 8.4% in 2011, led by PC & cell phones which account for 60% of semiconductor consumption. 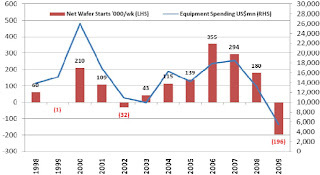 Equipment billings at all time low and capacity is down: Despite improving sales, global semiconductor production capacity is still declining, down from its peak of 2.43mn wafer starts/week in 3Q2008 to 2.1mn wafer starts/week in 2Q2009, due to production cuts worldwide amid drop in demand. Also, global equipment billings on semiconductor equipment are at historical lows, at US$2.67bn in 2Q09 from US$11.17bn in 3Q07, the start of US housing crisis. Against this backdrop coupled with stronger demand in 2Q2009, utilization rate rose sharply from 56% in 1Q2009 to 77% in 2Q2009. Buyer’s market turns to seller’s market in 2010? Although semiconductor prices will remain weak in 2009 due to weak demand, the baton will be passed to become a seller’s market. Reduction in global production capacity, coupled with historical low capital spending, capacity shortage might flare up should demand pick‐up strongly in 2010 as utilization rate would have peaked. Even if the North American equipment billings do increase by 47% to US$8.0bn in 2010 according to SEMI, it might still be inadequate to significantly increase production capacity and will probably lead to firmer selling prices in 2010. Growth will be driven by their China operations with the management intending to grow its business in China by 100% p.a. Unisem plans to increase China's revenue contribution from 12% to 50% within 2-3 years. The low cost structure and tax incentives given to them in China also bode well for them. Share price movement has been trading between RM1.44 to RM1.70. Will have greater room for upside with stronger quarterly earnings, earnings expansion from its China's operation and possible listing of its China's operation.